Azedah Hussaini, Battle, paper, glue, acrylic on canvas, 16" x20"
Azadeh is a visual Artist resides and works in Chicago. She first inspired by her father who is an established abstract painter in Iran. At the age of 13 she began taking early steps of learning to paint in an informal studio with her father. Later, she honed her passion for art by education gaining her BFA from Azad Art University in Tehran and MFA from Academy of Art University in San Francisco. Since her first solo exhibition at the age of 19, her technique has gradually shifted from figurative art to abstract. In the past two series of her figurative paintings on war and women, have been displayed in art exhibitions in the USA and Iran. Years later, inspired by nature, Azadeh’s creativity took a different turn. Immersing herself in nature, she focused on color composition, which resulted in deepening her knowledge and understanding of color. Fascinated by her rich heritage, Azadeh’s knowledge of color became a privilege for her to capture the spirit of colors in Persian rugs. Analyzing Persian Rugs was an interdisciplinary project that combined her art and talent with the Persian Culture. Meanwhile, she began to find a balance in her new paintings by combining simplicity of colors, emphasized in her previous work, with the complexity of patterns. Furthermore, focusing on the rhythm and patterns in Persian rugs encouraged her to further study the relationship between nature, people and culture. In her new body of work, she is inspired by organic forms. She employs them as the base of her work to express various concepts. 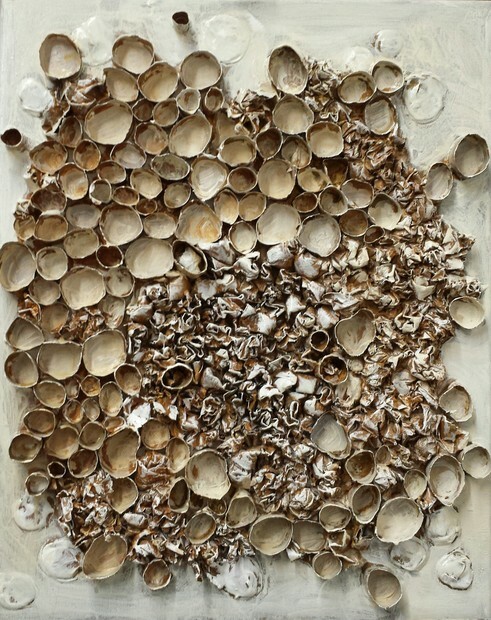 Cardboards and papers are her essential tools to enhance the recognition of organic forms through her artworks. The best part about this game is that we all are working on one piece and sharing and mixing our feeling without knowing each other. Amazing feeling! To me this was playing and working with somebody else's idea and transferring that into a new form. It was fun, difficult and challenging. It was like giving a new character and soul to an already existed creature by being committed to its original personality.